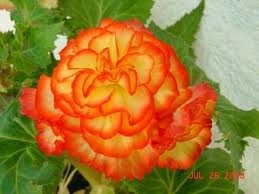 The begonia is a versatile tropical plant, performing well in containers, pots and garden beds in temperate areas. Begonias exhibit dense, textured foliage and dramatic and colorful flowers. While the plants are not tall, topping out at 9 inches, they are quite dense and benefit from trimming. 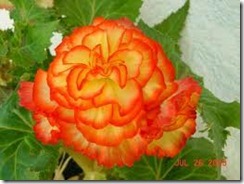 Begonias come in a range of styles and are sure to delight the experienced gardener. Begonias will not tolerate frost and will die unless moved indoors. Look over your begonia plants, noting any dead or shriveled flowers or leaves. Since begonias will propagate from cuttings, you may wish to take cuttings of healthy begonia shoots while you trim. Cut all dead flowers and plant growth off at the stem. Remove this to a trash bin or compost area. Nip any blooms or leaves growing inward rather than outward. Gently remove these by pinching the bloom with your fingers or with scissors to encourage the plant to grow outward instead. Remove any healthy cuttings that you wish to propagate by snipping them off with the clippers close to the stem. These should be placed in water until new roots begin to develop. Clean up the plant by trimming excess interior growth with your clippers. While you should always pull dead or bruised growth for the health of the plant, you should trim any excess growth for aesthetic reasons and to prevent bushiness. Should you have begonias outside that you plan to overwinter indoors, bring them inside in early autumn so they can acclimate to the low light and dry atmosphere before you turn the heat on for the winter, exacerbating dry conditions. These plants are finicky and not recommended for beginners.